Android 5.0 Canada G2 G3 Galaxy htc LG Lollipop Moto E Moto G moto x motorola Note one One M7 one m8 OnePlus samsung xperia So where's our Lollipop? 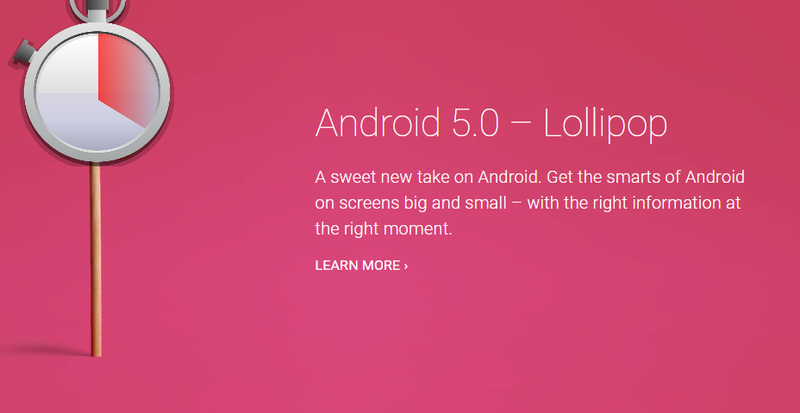 At Google IO in June of 2014 we were introduced to Lollipop. At the time it was still a work in progress, but it whetted our appetites like we hadn't had before. We've been used to an announcement from Google about Android and as they announce they also say "and it's ready now". it was one of the nice stand apart features to our iOS counterparts that they would announce and then tell you to wait. So we waited with this version of Android; this being around the 20th version to be announced (if you go by API levels). We waited from June until late October when we saw that the Nexus 6 was launched. It wasn't until early November (almost 4.5 months) that the images came online. That's as long as we've waited for some devices (usually some of the first wave after Nexus) to get an update. And that's just to make it publicly available. Now, how much longer do we have to wait for it to hit the non-Nexus lineup? I'll write again that this is all speculation, so no actual timelines have been written in stone or confirmed. try asking a carrier or OEM for that date and you'll be hard pressed sometimes to get any information out of them more than a few months. Interestingly enough HTC has put their semi transparent process up on their site, and the M8 is in Stage 2 - integration - and the M7 is in Stage 1 - development for any of the carriers. If you look at unlocked or developer editions they're all at Stage 1. HTC has also publicly said that they have the clock ticking as they set themselves a 90 day deadline from when Lollipop available to when it should be available for your phone (how your carrier will roll that out will vary tho'). 90 days should 'expire' on Feb 3 (actually February 2nd as January has 31 days). This was found in some rumour piles among the internet scraps as for the most part LG has quietly said "early 2015". We have seen that several European countries and in South Korea the update has rolled out, so maybe they've set the bar further ahead to that they can beat their expectations (under promise, over deliver!). For the Moto line up I cannot find any inkling of any timeline (and all 2013 and 2014 devices will get it they've assured); however there have been some devices in the US who've gotten the update already. Like HTC, OnePlus had put up a 90 day deadline for themselves. Galaxy Note 2 - maybe? Galaxy Note 8 - maybe? Galaxy Note 10.1 - maybe? Damn, that's a lot of devices... it's tiring just writing it all out. For the most part you can see that the newer devices are looking to be in that 90 day range. A season older and it's stretching it to 120 days. We've also seen that some models like the Note 4, S5 have been receiving it in specific countries. Samsung has had a pretty good reputation for updating, but I'm querilous about seeing items like the Note 2 might get it; and I'm wholly doubtful that some who've reported the Note 8 would get it, as it hasn't gone past 4.2 in Canada yet. A pretty blanket answer that several devices will get the update in early 2015. Closest to a timeline we can get is how at CES they said the latest devices should see the update in February. Don't forget, well be updating our databases regularly as we get the information, so check there for the latest.